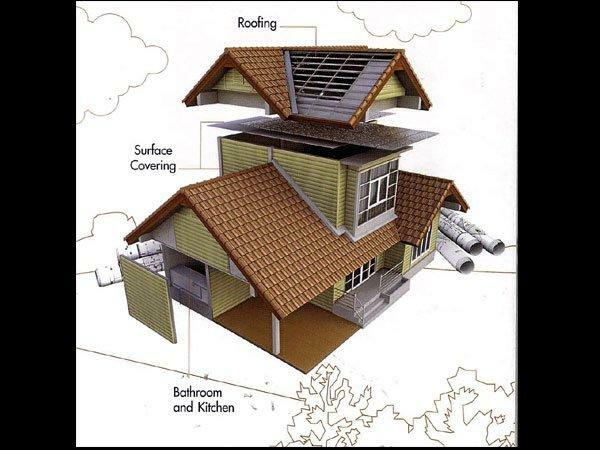 Here are a few options for roofing material. Just a slice of the information available ... please add your own experiences, comments and suggestions. Our house (built 2008) uses windows from SUNPARADISE (Fiesta 42 and HD 50) and we are very satisfied with the built quality and the after sales service. But they don't offer double-glazing windows (as fas as I know). Imported, specialist and unusual alternatives to materials that are normally used here in Thailand are all very good, and probably in the long run would offer better solutions and higher build quality, but I subscribe to the notion that if the building team haven't used the materials or system before, then it's probably wise to not be the person to start paying for experimentation and on-the-job training! I looked at all sorts of roofing as well as construction materials and methods for my build, but as I went with a local team, after some discussion with the builder, we decided that the tried and tested way would be most straightforward and cost effective. Concrete, brick, steel frame roof, hardwood windows and doors, and after some discussion (mostly dismissal of the alternatives by my builder), went for CPAC Monier roof tiles... They have been around for 70 years and still do a very good job, as many alternatives seem cheaper, or look funkier, but are not up to the weather here. One important feature in the Monier tiles is that they have interlocking rain channels, which stop water seeping underneath when there is a strong wind. Many other roofing systems I looked at had nothing like this as a back-up in their design, which in my opinion is just asking for trouble. Again, the overwhelming element when choosing systems or materials is familiarity. Yes I could have gone with Qcon, but then I'd have to change the team for that, same for galvanized roofing system, and not save anything on costs, as each team would add on their mark-up's to compensate for the piecemeal fashion of the job (as opposed to an all-in cost). Same goes for windows, many would poo-poo the idea of hardwood frames in favour of UVPC or Aluminium, for ease of maintenance and supposed lifespan, but I have seen such shoddy installations of both that I just didn't see them being options in my plans. That said, if wood is chosen, there are a few more considerations and definitely more maintenance... but ultimately, I see doors and windows as an inherent design feature for a house, rather than just functional devices to cover openings, so my choice was down to aesthetics as much as anything. As I am still building my shack, I won't say I know it all, and I am sure to come unstuck in some way, but I have lived in LOS for long enough to have experienced living in a wide range of different buildings from antique teakwood houses, condos, to modern pool villas, to get an idea of what mistakes can be made and the levels of quality of construction and finish that are deemed as acceptable over here. Some food for thought in that study, although the study itself does not cover insulation other than the insulating properties of the various roof materials themselves. And I would have liked to see a larger range of materials used, particularly more than one type of metal roof. the metal sheet ... has the best quality of reflection the heat radiation. By this quality, the indoor temperatures of the metal sheet prove to be very low, closed to the clay tile. At night, the heat in the indoor space release to outdoor as slow as the clay tile. It can be because its reflection quality. Most of that is the opposite of what I believe, and what logic tells me. Yeah, I agree the metal sheeting not being particularly "reflective" I'm regards to heat. The opposite really. I'm going to replace my roof, and in my opinion, shingling will be a better choice. By the way, I've found a good source that provided me with the information about choosing a proper shingle colour. It has to be noted that your link is useful for me as it is important to take into account energy saving before I start the installation. Thanks for sharing! As a matter of fact, the roofs with metal sheets are the most "reflective" from all available roofing materials.